GREAT KILLS, Staten Island (WABC) -- One cold weather story out of Staten Island is warming hearts. 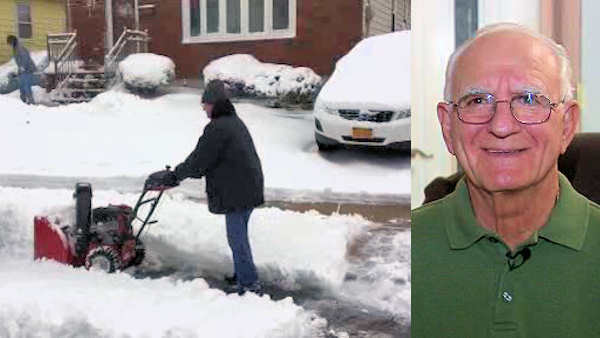 John Laresca is an 81-year-old retired firefighter who is kind enough to clear all his neighbors' driveways whenever it snows. He says he gets pleasure out of helping others. "The payback is in doing good," he said. "Just doing good, and trying to share with other people. This whole world, the way it is today with all the problems it has in it, maybe it's a good thing for the people out there to start getting together and cutting out all this hate." Laresca is so dedicated to the task that even hip replacement surgery just three weeks ago could not stop him. "The only one who could stop me is Him," he said, pointing upward. "When He says 'You're done,' then I'll be done." Laresca said he cleared out up to 20 houses on the block.